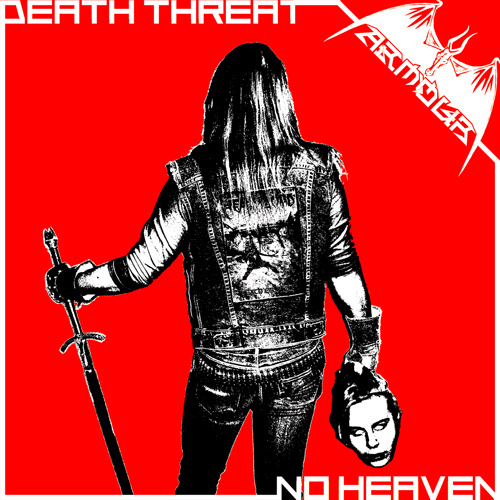 Dead Seed Productions - ARMOUR "Death Threat / No Heaven" 7"
ARMOUR "Death Threat / No Heaven" 7"
NWN! seldom dives into the murky waters of contemporary or “retro” Heavy Metal as the practitioners of this anachronistic form so often miss the mark by a considerable margin. Over the last several years, however, Finland’s Armour, has proven to be among the few capable of producing genuinely satisfying classic Heavy Metal and Hard Rock. Drawing on influences ranging from NWOBHM (i.e. Di’Anno era-Iron Maiden etc.) to early 80′s U.S. Hard Rock and Heavy Metal (i.e. early W.A.S.P. and early Mötley Crüe), Armour’s music is every bit as inspired and primal as the sources of inspiration from which Armour derives its sound. Led by vocalist and guitarist Lauri Penttilä (a.k.a Vince “Werewolf” Venom, Werwolf, and countless other aliases) whose numerous other bands include, among many others, Satanic Warmaster – his most notorious project. While many fans may have initially been wary of hearing Black Metal musicians taking a stab at pure Heavy Metal, Armour’s consistently strong track record has evaporated any doubts that the skeptics may have previously harbored. Armour employs a level of musicianship and craftsmanship commensurate with the bands’ predecessors in the genre and the band does so without a trace of irony. It is clear when listening to this EP that the members of Armour have studied and lived the music they emulate and they are constantly tapping into something elemental inside themselves to conjure up a sound so authentic. Various factors contributed to the delay in releasing this EP, but after the long wait, the “Death Threat” 7” is finally unleashed.